Should we say, "That's between him and God?" Or should we say, "How do I help the man of God travel in style? Where do I give?" According to Duplantis, he wasn't asking his followers for money. Rather, he wanted to inform them so they could believe God with him for the jet. And, he said, "I'm not asking you to pay for my plane." Regardless of why he made the initial announcement (I'll leave that between him and God), let's look at four unhealthy reactions to his announcement. Then, I'll suggest the real questions we need to ask. The first unhealthy reaction is based on hyper-gullibility. "We dare not question the man of God. If he says God told him, then it must be so. We don't want to touch the anointed." In my newest book, Playing with Holy Fire, I noted that gullibility was one of the hallmark weaknesses of the Pentecostal-Charismatic church. (I say this as insider, not an outsider.) It's the flip side of one of our hallmark strengths, which is faith. But it is a dangerous flip side. The second unhealthy reaction is based on hyper-criticism. Some Christian critics have already damned Duplantis to hell. To paraphrase, "This is proof he's a wolf in sheep's clothing! We always knew he was a deceiver." Actually, unless we can show that he himself is not a true Christian leader - either by his doctrine or by his life - then this one announcement does not prove that he is a false teacher. Let his ministry (along with all of our ministries) be evaluated fairly, biblically, and comprehensively. The third unhealthy reaction is based on hyper-prosperity. "God wants the best for His children," some say. "So, if you're going to get a private jet for your ministry, get the best. God is not a pauper!" This appears to be a principle Paul and his colleagues failed to master. He wrote, "Up to the present hour we are both hungry and thirsty; we are poorly clothed, roughly treated, homeless; we labor, working with our own hands. When we are reviled, we bless; when we are persecuted, we endure it; when we are slandered, we respond graciously. Even now, we are like the world's garbage, like the dirt everyone scrapes off their sandals" (1 Cor. 4:11-13). I address this hyper-prosperity mentality (along with the "superstar leaders" syndrome) in Playing with Holy Fire as well. I was speaking with a ministry colleague who heads up a massive evangelistic work. He mentioned a famous prosperity preacher to me and said, "This guy has probably given $50 million to our ministry over the years. He practices what he preaches." And that leads me to the two questions I have regarding Jesse Duplantis's announcement. I don't know him personally and I only heard him preach in person one time, several decades ago. And I'm not here to present a critique (or defense) of his ministry. If a private jet is legitimately needed due to his travel schedule (God and his board know; I don't), does it have to be this expensive? As servants of the Lord, do we need to travel in such luxury? 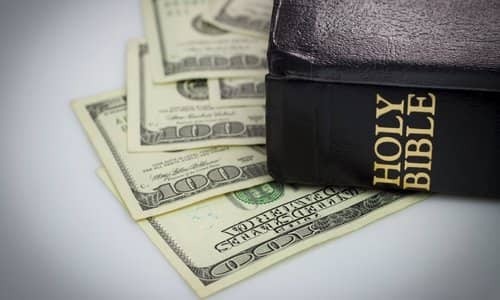 It's true that God's funds are unlimited. But our own ministry funds are not. Choices must me made, and by saving an unnecessary expense, we can free up funds for other gospel work (like providing full-time support for some Indian tribal pastors at $50 a month). At present, I've been overseas more than 160 times, sometimes with consecutive trips just days apart. Such travel is quite grueling, regardless of where on the plane you sit. The first 50-60 trips, I virtually always flew economy. The last 100 or so, I've virtually always flown business, often at the expense of those inviting me. But with the intensity of my schedule (which I wouldn't wish on others) and with my height, it's a good investment to make. Yet it would not be a good investment for us to own a private plane, even an old one. My second question is this: Does Jesse Duplantis's announcement bring reproach to the gospel? Does it make it more difficult for other Christian leaders to raise funds for their work? Does it play into the image of the self-serving, manipulative televangelist? My recommendation is that, in such cases, we follow Paul's guidelines set forth in Romans 14 (in a different context): "The faith you have, keep to yourself before God" (Rom. 14:22). There's no reason to announce it to the world.